As in previous conflicts, Israel claims its right to defend itself in its current conflict with Hamas in the Gaza Strip. But its response, killing hundreds of civilians in response to the deaths of a few Israelis, is wildly disproportional and thus a violation of international law. 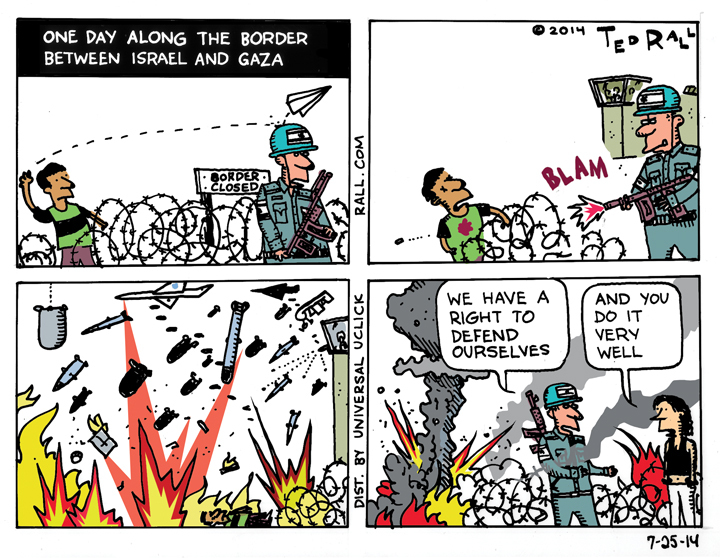 This entry was posted in and tagged air raids, Bombs, border, disproportionality, Gaza, Hamas, Israel, Middle East conflict, Palestine on July 25, 2014 by Ted Rall. The Boston Marathon bombings have prompted Republican calls to delay immigration reform and tighten the border. But self-radicalized Muslims can be born here. The solution: conduct background checks at the womb. This entry was posted in and tagged birth, border, Boston Marathon bombing, Checkpoint, childbirth, Fort Hood shooting, Hospital, Ice, Immigration, Immigration and Customs Enforcement, kicking, mom, mother, Nidal Malik Hassan, OB-GYN, self-radicalized Muslims, trimester, vaginal introitus checkpoint on April 29, 2013 by Ted Rall.